Directed by Glenn Ficarra and John Requa. Produced by Ian Bryce, Tina Fey, and Lorne Michaels. Written by Robert Carlock. Release date: March 4, 2016. Audiences going into Whiskey Tango Foxtrot are likely to expect a flat-out comedy following Tina Fey and her misadventures in Afghanistan. After all, the marketing has focused almost solely on this aspect of the picture, probably because that's more likely to sell tickets than "it's about this woman trying to find herself while away from home, and also there are some jokes thrown in." For two hours, we sit there hoping for more jokes than are featured in the trailers, and for two hours we find ourselves wanting. 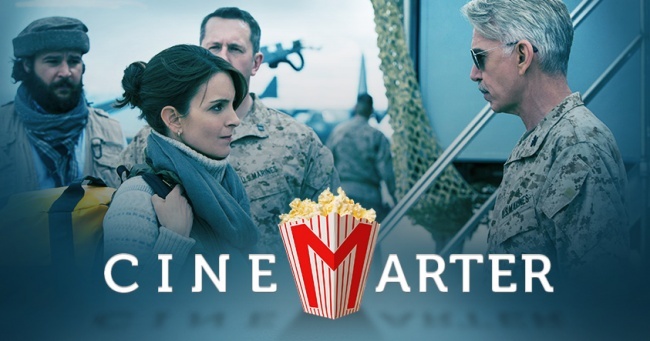 Whiskey Tango Foxtrot isn't a bad movie, but if you go in expecting the movie that's been advertised, you're going to be disappointed. Fey stars as Kim Baker, a reporter who volunteers for a three-month stint in Afghanistan, only to wind up staying for several years. She's sick of her life in America, and when the opportunity pops up to become a war correspondent in front of the camera - instead of having her talent wasted behind it, writing scripts for the daily news programming - she jumps at it. What she discovers might not lack in intrigue or intelligence, but it does lack in the jokes. Ultimately, the film plays out over the course of a long period of time and details her interactions with various people. Tanya (Margot Robbie) is a journalist from a rival network, someone with whom she develops both a friendship and rivalry; Gen. Hollanek (Billy Bob Thornton) is the most prominent member of the military she meets; Iain (Martin Freeman) is a Scottish reporter who serves as our primary love interest; Fahim (Christopher Abbott) is her translator and friend; and Ali Massoud Sadiq (Alfred Molina) is local high-ranking official. It's a good cast and they're all playing interesting, if underdeveloped, characters. The idea here is that a woman is going to Afghanistan, one of the least friendly-to-women countries on the planet. The film pokes fun at many of the various cultural norms of the country, although it's not going to get particularly venomous or political here. This is Kim Baker's story and, for the most part, it just follows her and her various interactions and learnings within a repressed society - even though a good chunk of the film takes place in the "Fun House," an area in which journalists from around the world hang out and party.